This truly is a cake fit for a King; THE King! 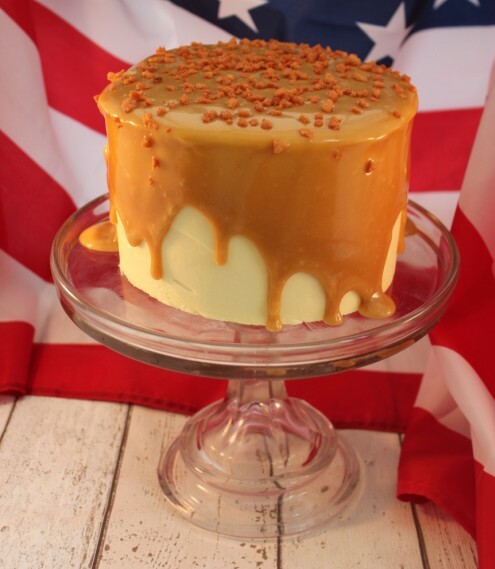 The closest thing that America has had to a monarch in a couple of hundred years was Elvis Presley and am such a fan of his music that I wanted to create this cake in his honour, based on his legendary sandwich fillings. The legend has Elvis munching away on sandwiches of banana, peanut butter and bacon, so these are the elements that I have combined here. Yes, even the bacon! As a vegetarian, I have opted for bacon flavoured salad topping, though you could fry up your own crispy rashers and crumble these on top if you like. Or stick to dried banana chips and peanuts if you don’t want to go the whole hog… sorry! In a separate bowl, combine your flour and raising agents with a pinch of salt and a pinch of ground cinnamon. Carefully fold half of these dry ingredients into your cake mix. Add your yoghurt and mix until combined. Fold in the second half of your dry ingredients. Finally, stir through your mashed bananas until evenly distributed. Divide your cake mixture between 2 lined 8″ sandwich tins and bake for 30 minutes, or until risen and springy to the touch. Cool these cakes in their tins for 10 minutes before turning out onto a wire rack to cool completely. Sandwich your two banana cakes together with a thin layer of Banana Frosting in the middle (click here for the recipe). Cover the top and sides of the cake too and refrigerate for 30 minutes. “This is a real explosion of sweetness and flavours. Makie the peanut butter sauce by mixing its two ingredients together in a bowl. Pour peanut butter sauce over the top of your chilled cake, concentrating on creating a large pool in the centre of the cake. As you pour, this puddle of sauce should expand and creep towards the edges of the cake. Stop pouring as the sauce starts to drip down the sides as this will continue for some time after you stop!